Our selection criteria for all categories is the same every year: the items have to be things we have actually used or would actually want. We have been cooking up a storm in the RainyDayKitchen. 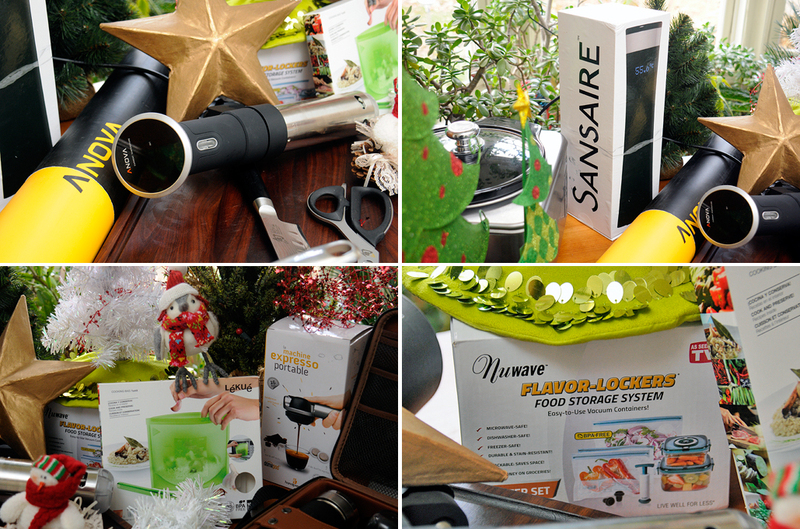 Here is the gear that made our culinary efforts easier and more enjoyable. Anova Culinary Bluetooth Precision Cooker – The Anova Precision Cooker is the perfect sous vide device for the home chef. It’s easy-to-use, lightweight, and connects to the smartphone for great results with the touch of a button. Sansaire Sous Vide Immersion Circulator – Sansaire uses precise temperature control to achieve repeatable results that can’t be replicated by any other method. Foods are cooked evenly from edge to edge, to the exact doneness desired. Lekue Silicone Bag – Cooking with Lekue’s silicone bags are completely safe and have many advantages. There are no leftover residues to alter the flavor of food. Lekue’s products are non-stick, do not require greasing, which means there is no need to add extra butter and/or oil. Nuwave Flavor Locker Food Storage System – This vacuum storage system comes with everything needed for storing everything from fresh meats to leftovers. Shun 7″ Classic Hollow-ground Santoku – A santoku is a Japanese all-purpose kitchen knife. Shun’s VG10 steel santoku, known for its incredible edge retention, is clad with Damascus stainless steel, then ground and bead-blasted, revealing the flowing pattern of the layered steel. 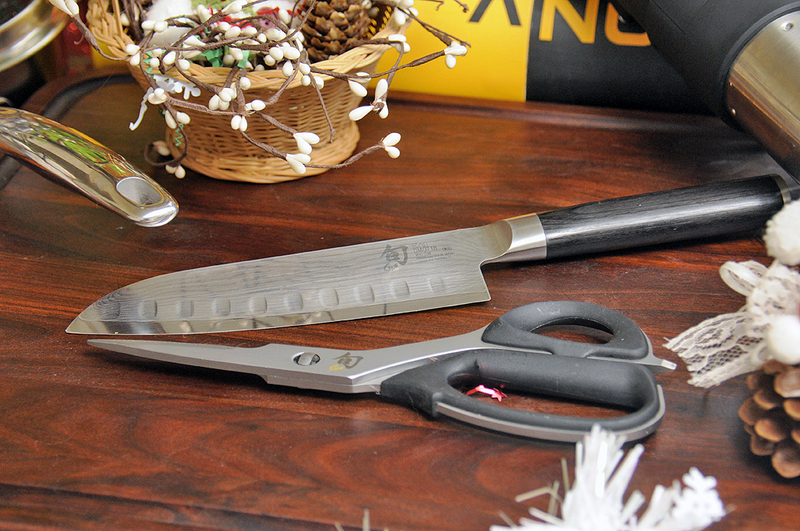 This Shun features beautiful Damascus-clad blades and D-shaped ebony PakkaWood handles. 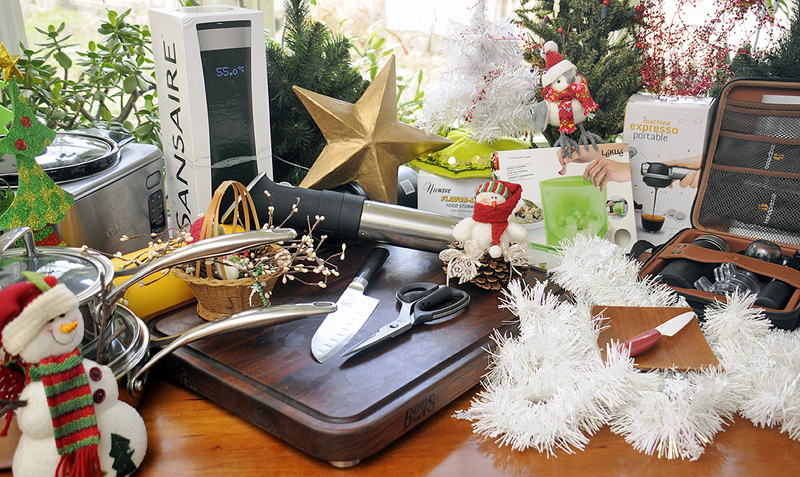 Shun Kitchen Shears – Shears are the perfect companion in the kitchen. The Shun kitchen shear blades are made from high-carbon, molybdenum-vanadium stainless steel for durability that lasts. They also come apart for easy cleaning. Zwilling Thermion Non-Stick 1-Quart Saucepan with Lid – The patented Thermolon nonstick ceramic surface is a cookware breakthrough. Compatible with all cooktops including induction, the Zwilling sauce pan features an ergonomic, riveted stainless-steel handle that stays cool to the touch. Zwilling Stainless 3-qt. Saute Pan with Lid – Fully clad, 3-ply stainless steel construction with a thick aluminum core that conducts heat quickly and evenly. This cookware is suitable for use on all stove types. 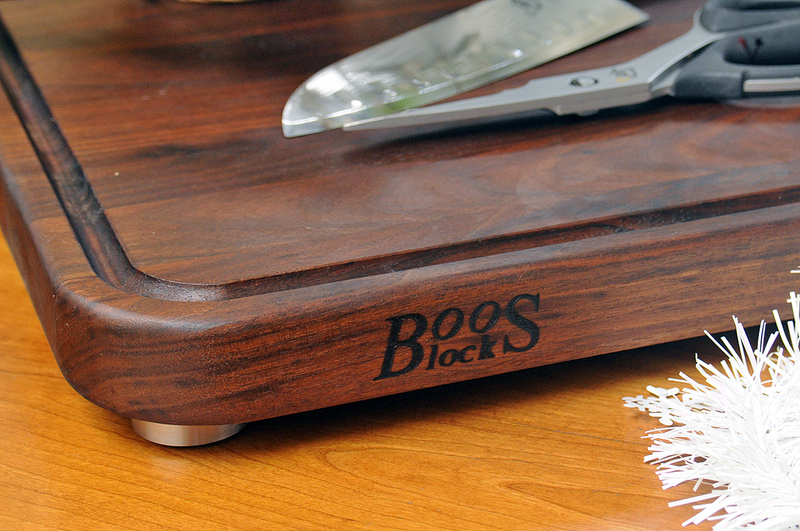 It is also oven and broiler safe up to 500º F.
John Boos Walnut Tenmoku Cutting Board – The rich colors and the shape of the juice groove are reminiscent of the ancient glaze and shape of Asian Tenmoku pottery. The board features beautiful edge-grain construction, a cream finish (as opposed to an oil finish), and four stainless steel feet. Handpresso Outdoor Espresso Set – This set contains the small, portable Handpresso Pump, four unbreakable cups, an insulated thermos flask, and small napkins. Very elegant. Handpresso Wild Hybrid Espresso Machine – The new machine can use E.S.E. pods or ground espresso coffee. The hand pump can generate 16-bar pressure. No battery, no electricity needed. Savino® Wine-Saver Carafe – A unique wine preservation system where the float creates a physical barrier between the wine and the oxygen. 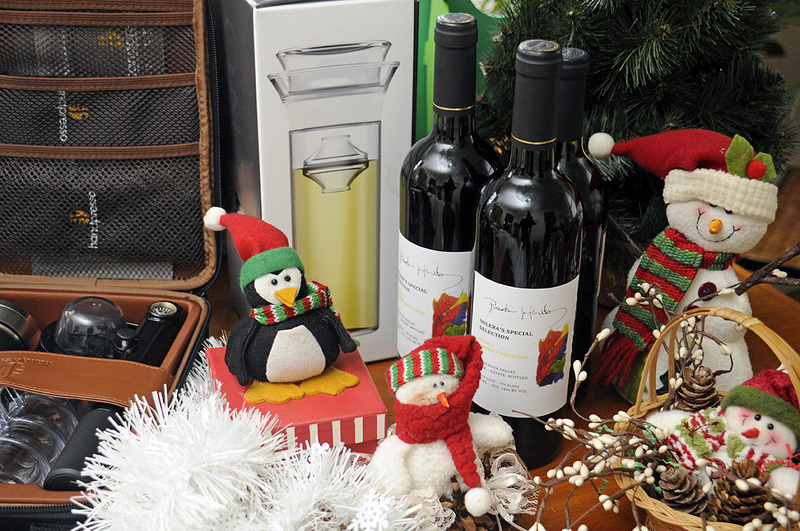 It can keep the wine fresh for up to a week after opening. Houdini Vertical Wine Opener – This innovative corkscrew design opens wine bottles quickly and effortlessly. Useful on all bottle sizes, and easily removes corks made from different materials. Comes with an extra spiral and matching foil cutter. Screwpull Vertical Wine Opener – The best we have ever used. Hardened Teflon-coated stainless-steel screw makes for smooth operation. It easily lifts out corks with a simple up-and-over motion, requiring far less effort than standard pull-type openers. Includes a foil cutter and comes in a handsome storage box.